The label on a can of Rambling Route cider describes the journey apples made across the country to Washington: “When it reached the land that would be called Washington, the apple knew.” It knew it had found a home in the soils and climate of the Pacific Northwest. Today, cider has found a welcoming home here as well. From new cideries and orchards around the state to cider science at Washington State University, the fermented beverage has come back in a big way. Cider is arguably the drink that built this nation. Not beer, not wine. Once upon a time, nearly every family in colonial America had a small cider press for making their own because cider was considered safer to drink than water. Wherever John Chapman, aka Johnny Appleseed, went he left a trail of trees that would serve as homestead orchards for making cider. Cider prevailed as the beverage of choice in early America until the early temperance movement and then prohibition drove the final nails in its coffin. Cider has soared to the top as the fastest growing alcoholic beverage in the nation. Although cider accounts for less than 1 percent of the entire beer category, even the popular craft beer movement has not grown as fast. Compare craft beer’s growth of roughly 20 percent annually with cider’s steeper curve of 65 percent annually. But as with craft beer, Washington state is at the leading edge of the cider revolution that is sweeping the nation—both in production and consumption. 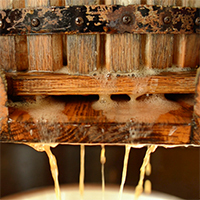 With upwards of 30 cideries, Washington boasts the most in the United States. When English colonists first arrived in North America, they enthusiastically embraced the wide range of wild fruits they found, from grapes to berries. But crabapples were the only native apple species, so colonists started planting edible apples in New England from imported seeds as early as 1623. Apples flourished in the fertile soil and friendly climate, and soon apples were a key part of most colonial farms and menus. These new orchards were so bountiful that most farmers ended up with a much larger crop of apples than they could actually eat. By fermenting these apples into hard cider, the colonists were able to create a tasty drink that would remain fresh and usable much longer than the raw fruits. Better yet, hard cider may have been a safe alternative to any suspect drinking water supplies. For the early settlers, hard cider had several advantages over beer. The colonists had a difficult time cultivating hops and barley and had to import these raw ingredients or have barrels of beer shipped across the Atlantic. Meanwhile, apples had no such drawbacks, which cleared the way for hard cider to become the nation’s drink. Hard cider was a key component of the colonial economy since currency was often hard to come by in the colonies. There was plenty of cider to go around, though, so in the absence of money, cider became as good as cash. Colonists would pay their bills with barrels of cider and worked out barter arrangements. Cider and applejack (hard cider that had been further fortified through freeze distillation) were supposedly even used to pay the construction crews that built some of the country’s first roads. Although hard cider was terrific for preserving large apple harvests, it played an important role in colonists’ other dietary staples. By further fermenting cider, the Colonists could create apple cider vinegar which became a crucial ingredient and colonial condiment. Most importantly, though, this vinegar created from hard cider allowed colonists to preserve vegetables through pickling, a godsend during long New England winters. But there’s a hitch in the cider revolution. Washington leads the nation in apple production. It’s chock full of apple orchards, but few contain cider apple varieties. Once pressed into juice, fermented, and blended just so, cider apples impart flavors unparalleled by everyday eating apples, or dessert apples—the predominant source of most ciders today in the United States. Cider makers who want to produce an authentic, artisanal cider that appeals to an increasingly sophisticated palette can’t get enough locally grown cider apples. 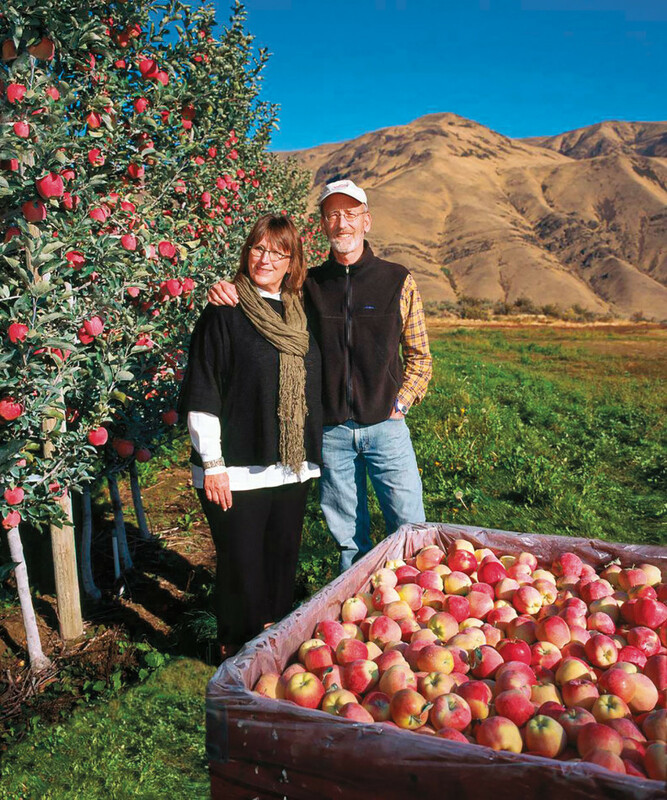 In 2008, Craig Campbell ’73 and his wife Sharon felt the “cidery shock wave” surface in their eastern Washington orchards. They began experimenting with making cider from dessert apples grown in their 400-acre commercial fruit orchards. Despite naysayers who warned that cider apples required a maritime climate, Craig also planted a two-acre test orchard with 25 varieties of cider apples. Now the Campbells grow cider apples to supply their own commercial cidery, Tieton Cider Works. They’re leading the way in modern cider apple orchard management, and partnering with WSU researchers to help the industry meet the demand for a nation thirsty for local craft cider. 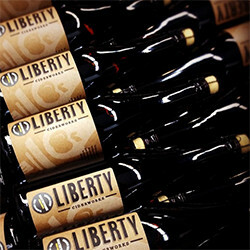 Their two-acre experiment expanded into Cider View, a 30-acre “high-density” cider orchard. With additional blocks of both apple and pear trees for cider, Cider View has become the largest cider orchard in the state. In fact, with 55 acres of cider apples and pears altogether, it’s one of the largest in the country. This year, Tieton Cider Works is producing the equivalent of 100,000 cases (160,000 gallons) in kegs, bottles, and cans, but the Yakima facility has room to grow to 500,000 cases annually. Craig Campbell, a third-generation farmer and a third-generation WSU alumnus, grew up on his grandfather’s farm, the land he now farms near Tieton, Washington. After graduating with a degree in horticulture, his father encouraged him to leave the farm. Craig headed to California where his father’s wisdom paid off in two life-changing ways. The first was the start of his still successful fruit distribution business, a handy background for understanding cider distribution. The second was a blind date with the woman who would become his wife. “When I brought Sharon to see one of our family’s orchards near Pasco, she says, ‘Oh my God, we’re raising sticks.’” What looked to Sharon like simply sticks in the ground was Craig’s passion—newly planted trees. The phrase stuck and became Craig’s license plate RAZNSTX. The Campbells’ cider orchard is the latest manifestation of Craig’s passion. The 30-acre block of cider apple trees sits on a plateau above the Naches River, a tributary to the Yakima River. Tightly planted rows of trees with names like Golden Russet, Harry Master Jersey, and Yarlington Mill enjoy sweeping views of the river valley and mountains. In the spring of their third year, the trees are nearly in full bloom—more than mere sticks in the ground. In this modern, high-tech orchard the young trees are planted three feet apart and trellised to support a 12-foot high central leader. The arrangement maximizes yield per acre. The uniform rows are wide enough for a tractor to roll through, carrying workers on a platform to prune or harvest without having to climb up and down ladders. Come fall 2016, Cider View will bear its first load of fruit, which must be harvested by hand. But the orchard is designed to accommodate mechanical harvesting, once the technology is available. Mechanical harvesting of cider apples is one of many cider research projects at the WSU Northwest Research and Extension Center (NWREC) in Mount Vernon. The orchard-to-glass research program led by horticulturalist Carol Miles is one of only four university-based programs in the United States. Though small compared to beer and wine science, Miles says WSU’s cider research program is the largest in the country. Cider research at WSU began in the maritime climate of Mount Vernon in 1979 when Bob Norton planted six cider apple varieties at NWREC. Today, under the direction of Miles, a newly-planted research orchard includes 64 English, French, and old American varieties of cider apples. The research spans all aspects of orchard management as well as cider making, including sensory evaluation, marketing, and economic analysis in collaboration with specialists at the Pullman campus. Besides research, NWREC also offers cider education. Many Washington cider makers, including Sharon Campbell, have taken a cider-making course taught by British expert Peter Mitchell, offered by NWREC in partnership with the Northwest Agriculture Business Center and the Northwest Cider Association. Sharon Campbell, incidentally, helped start the association in 2010, and was president until last year. The NWREC program also produced a first of its kind manual for cider production and orchard management in the Pacific Northwest, written by Gary Moulton, former WSU tree fruit specialist and cider program leader. In the Tri-Cities, Thomas Henick-Kling, the director of the WSU viticulture and enology program, is evaluating how that program too might support the cider industry in Washington. He says that fermentation science and sensory evaluation for cider are nearly the same as for grape wine. Currently, students in the program can take electives in tree fruit production and most courses like plant pathology, entomology, soils, and plant physiology would be appropriate for cider and wine science students alike. At Tieton Cider Works, head cider maker Marcus Robert, a fourth-generation orchardist who hails from the winemaking industry, prefers to hire people with a wine science background. He worries that people who are eager to jump in to the cider industry won’t take the time to learn the art and science of it and risk producing bad ciders that could turn off uninitiated drinkers for good. As part of a national research team including Virginia Tech, Cornell, Michigan State University, and the University of Vermont, Miles is hopeful that the U.S. Department of Agriculture will fund a robust proposal to boost orchard-to-glass cider research across the country. She also sees cider production as economic opportunity for agriculture in the state. Miles anticipates a day when cider apple varieties are grown in every part of the state. And in Tieton, the Campbells are proving that cider apples don’t require a maritime climate. Wherever cider apples are cultivated, they are ushering in the return of hard cider to the United States. And this time, cider could be here to stay. 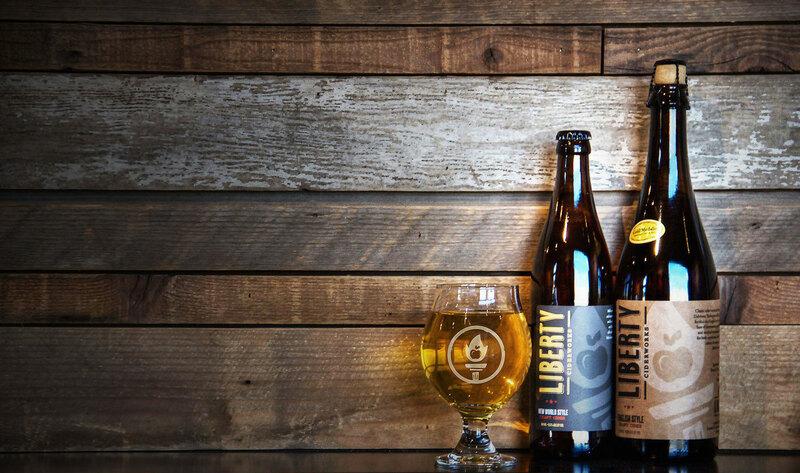 A WSU alum architect and his colleague make hard cider in Spokane. Read the story. A visit to Bishop Orchard in Garfield, Washington to make cider the old-fashioned way promises a fun time for all ages. Watch the video. 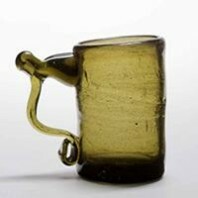 Glass, pewter, and stoneware mugs used for hard cider in Colonial America. View the gallery. 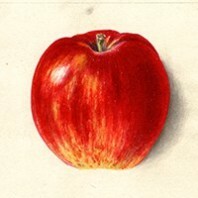 Watercolor images of heritage apples. View the gallery.